Wales' women were frustrated by an impressive Czech Republic defensive display as the nation paid tribute to defender Loren Dykes. The Wales full-back became just the second player to reach a century of caps for her country and was captain for the night. A record crowd of 2,168 were in attendance at Newport's Rodney Parade. Wales had enough chances to win the contest, but were denied by some poor finishing. While the result and especially the performance were important to Wales going into their Euro 2021 qualifying campaign, which begins in the Faroe Islands on 29 August, this was an occasion that really belonged to just one player. The 31-year old Dykes is unassuming off the field, but an inspiration to a generation on it. She made football history in Wales by joining the most exclusive of clubs, the 100-cap club. Dykes became just the second Welsh player to reach the milestone behind Lyon and Seattle Reign star Jess Fishlock. 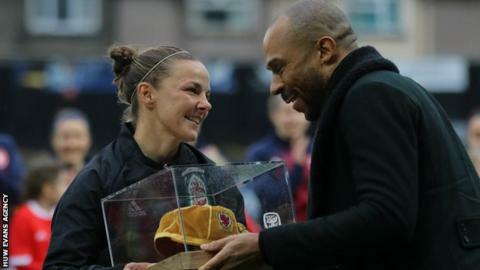 Dykes, a mainstay for Bristol City in the Women's Super League, has been enjoying a rare moment in the limelight, with heavyweight boxer Anthony Joshua among those to wish her congratulations on social media. The Wales players wore special shirts during their warm-up that featured Dykes' face and it was clear during the emotional pre-match anthems that the record means a huge amount to Wales' defensive lynchpin, who was her usual reliable self. Jayne Ludlow's side were looking to address an unwelcome statistic that has seen them go six matches - since a 3-0 win over Russia in June 2018 - without scoring. They could comfortably have opened their account in a first half they dominated, with a combination of poor finishing and good fortune keeping the score at 0-0. Fishlock twice came close, blazing over after a fine team move before forcing Barbora Votikova into an adroit save with a long-range effort. Helen Ward also missed the target with a promising opportunity, while Everton teenager Elise Hughes headed over from close range as Wales looked by far the more likely side to make inroads. However, the visitors improved after half time and Jitka Chlastakova rifled a right-footed effort just past the upright, while Lucie Martinkova headed straight at Laura O'Sullivan. Wales' best second-half chance fell to Natasha Harding, but her control let her down at the vital moment. Dykes was denied a fairy tale moment with six minutes remaining when her speculative cross came back off the crossbar, while Fishlock's deflected shot drifted just wide. "For us as a team it was a game of two halves. We were really pleased with the first 45 minutes performance. We created some really good goal-scoring opportunities and defended really well. "We lost our way for a 20-minute spell in the second half and there are definitely areas we can tighten up on. "They highlighted some weaknesses tonight we will have to change. "I am not concerned about the lack of goals. I would be concerned if we weren't creating chances. "I do hope it will change before August and I am sure that it will. "Loren did everything she needed to do... I am really pleased for her with her performance." Wales: O'Sullivan, Dykes, Ingle, Ladd, Evans, Harding, Fishlock, James, Ward, Hughes, Green.